The Galaxi Lathe combines the best features of larger lathes – power, capacity and capability with state of the art technology to make your turning more efficient, fun and safer. 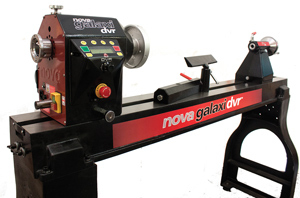 The NOVA GALAXI DVR Lathe is the most versatile lathe on the market. It combines the proven technology with some great new features. It is able to handle a wide range of work from very small pens to large 29” bowls using optional Outrigger Accessory. Spindle work up to 44" can also be handled with ease. The headstock can swivel 360˚ and can slide the length of the bed. Five indexed stops (detents) ensure that it will always come back into alignment with the tailstock center. The positive locking mechanism makes sure the headstock stays in position while the lathe is being used. The 1-3/4 hp 115V DVR Motor adjusts to the load to keep the RPM's stable during turning. The DVR technology with detect a catch and stop power to the spindle. The motor has 100% torque at slower speeds, unlike other AC Inverter controled motors. Available as an option is a Remote Control unit for turning the lathe on or off and raising or lowering the speed. The Galaxi is ready to use the remote. Standard Equipment: 6" faceplate, cast iron leg set, 12" toolrest, #2MT live center, 2MT 4-prong spur center, knock out bar, manual. This item is shipped from the manufacturer. An additional $100 will be added to regular Shipping & Handling. Air shipping and international shipping is not available for this item. Ships to the 48 contiguous states only.